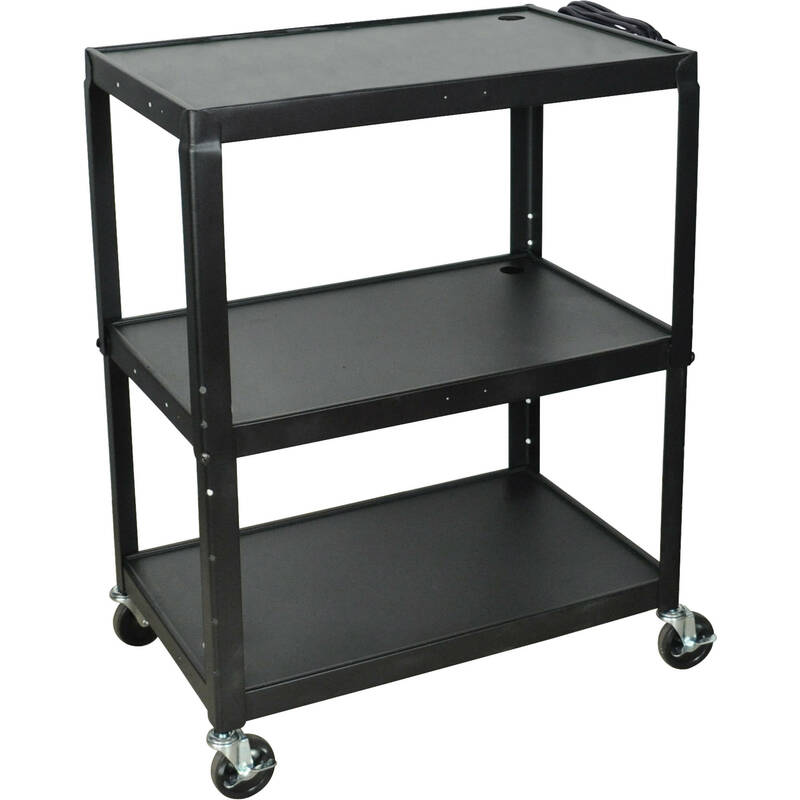 The AVJ42XL Steel Adjustable Height Extra Large AV Cart , in black, from H. Wilson is a rugged utility cart with steel reinforced shelves. The top shelf is height-adjustable from 24 to 42", which is the top point of the cart. All three shelves feature a 1/4" lip around the edges that help prevent slippage. The cart also has a UL-listed 3-outlet electrical assembly with a 15' cord, making it suitable for classrooms and similar environments. For moving it around, the cart has 4" ball-bearing casters with two locking brakes. Box Dimensions (LxWxH) 33.0 x 22.0 x 21.0"
AVJ42XL Steel Adjustable Height Extra Large AV Cart - Black is rated 4.7 out of 5 by 3. Rated 5 out of 5 by Rich from Portable Computer Desk Works amazingly well as a portable computer desk. I have 2x 34 inch ultrawides connected to it & use the space in between to store my keyboard. My custom computer goes on the bottom shelf. It’s a very stable & versatile cart. Rated 4 out of 5 by rehartsell from Nice Cart Good size and construction for our Photography Studio cart. Easy to roll around the studio with computer, display and other camera parts. Can you attach a drop leaf set to this product?